Eucalyptus nitens (Deane & Maiden) Maiden is widely planted in temperate regions of the southern hemisphere, principally for pulpwood production. Eucalyptus denticulata I.O. Cook & P.Y. Ladiges was previously recognised as an informal variant of E. nitens and, accordingly, was included in many ‘E. nitens’ field trials. We reviewed data from 85 E. nitens/E. denticulata field trials, located in Australia, Chile, China, Italy, Lesotho, New Zealand, South Africa and Zimbabwe and ranging in age from less than one year to 14 years, to investigate racial (among population groups) genetic variation in growth, wood-property, tree-architecture, fitness and morphological/developmental traits. Meta-analyses were undertaken on these data to gauge the significance of differences among races across trials. Race × rainfall zone interaction was also investigated by categorising field trials as summer-rainfall, winter-rainfall or nursery-based. Race × rainfall zone interaction was significant for growth traits only. In general, Central Victorian E. nitens populations outperformed New South Wales E. nitens populations in winter-rainfall zones, but this ranking was reversed in summer-rainfall zones. On average, E. denticulata grew less rapidly than the best-performing E. nitens races, particularly in winter-rainfall zones. Differences among races were detected in basic density, a commercially important trait, but these differences were small in magnitude. Significant differences among races were also evident in branch size and stem form (straightness). Eucalyptus denticulata races had significantly thinner branches than all E. nitens races except Southern Central Victorian, and Central Victorian E. nitens races generally had the straightest stems. 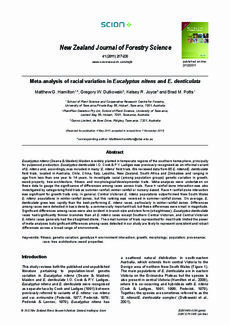 The small number of trials represented for most traits limited the power of meta-analyses but significant differences among races detected in our study are likely to represent consistent and robust differences across a broad range of environments. fitness; genetic variation; genotype × environment interaction; growth; morphology; population; provenance; race; tree architecture; wood properties.